Edgar Allan Poe’s Masque of the Red Death board game Kickstarter will be launching January 10th! 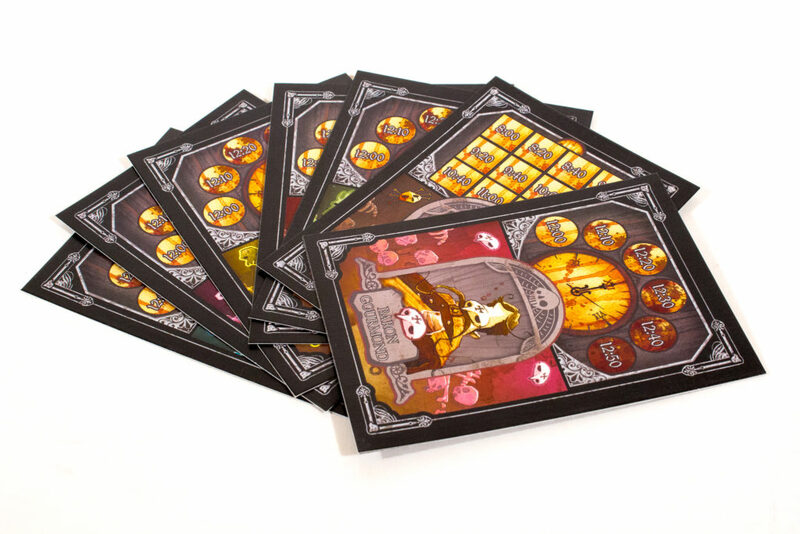 We are excited for this campaign, featuring fully illustrated game art from renown artist Gris Grimly and award-winning game design from Adam Wyse. 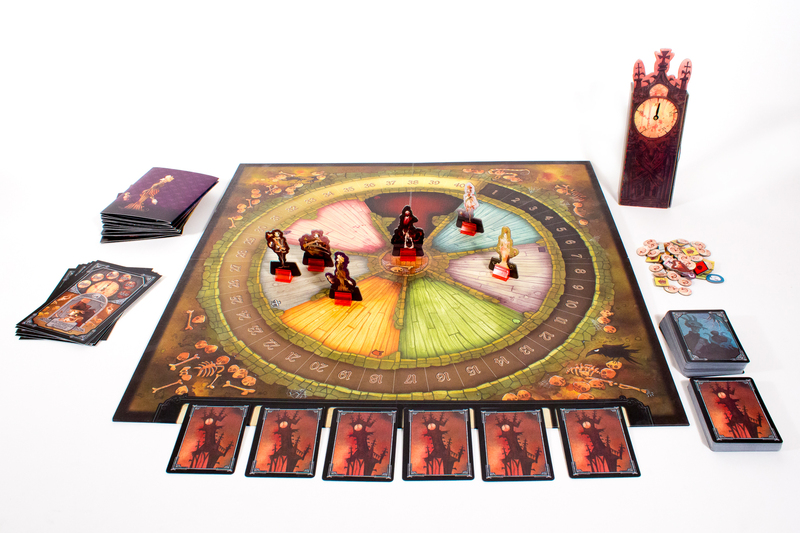 We took some photos with our early production copy, talked with Adam about some designer play tips, and wanted to share a sneak peek as we get closer to the campaign in January. The rulebook has also been uploaded on the Masque of the Red Death Page on BoardGameGeek, so be sure to check it! Masque of the Red Death is a deduction and movement programming game set in the grim world of the short story by the Edgar Allan Poe. Players are nobles attending an extravagant masked ball while a plague ravages the country. Players are trying to do what nobles do – feast, dance, celebrate –become as popular as they can. But rumors swirl as the night goes on, and everyone feels oddly nervous each time the clock chimes. The nobles might be wise to spend some time listening to these rumors. It is becoming increasingly clear as midnight approaches that something sinister awaits. At midnight, a horrible figure in the guise of the Red Death appears at the masquerade! It stalks amongst the rooms of the abbey, killing the nobles it comes across. 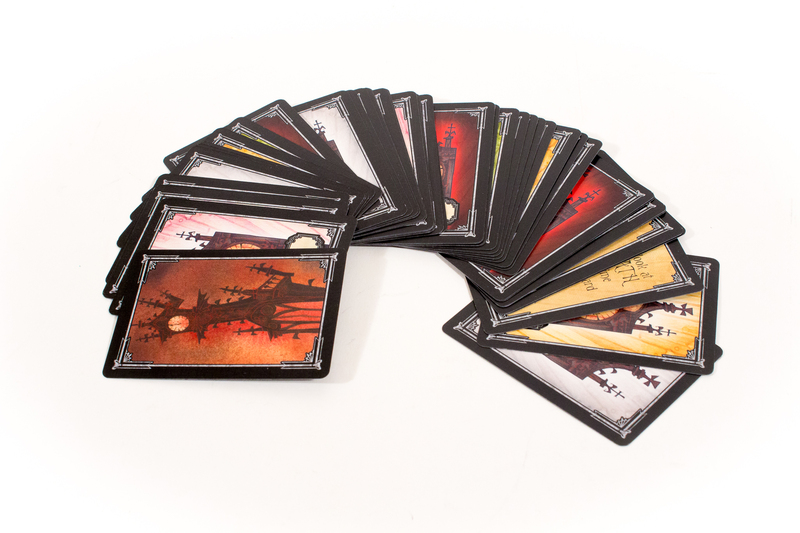 The most popular noble wins… but that only matters if you survive the night. 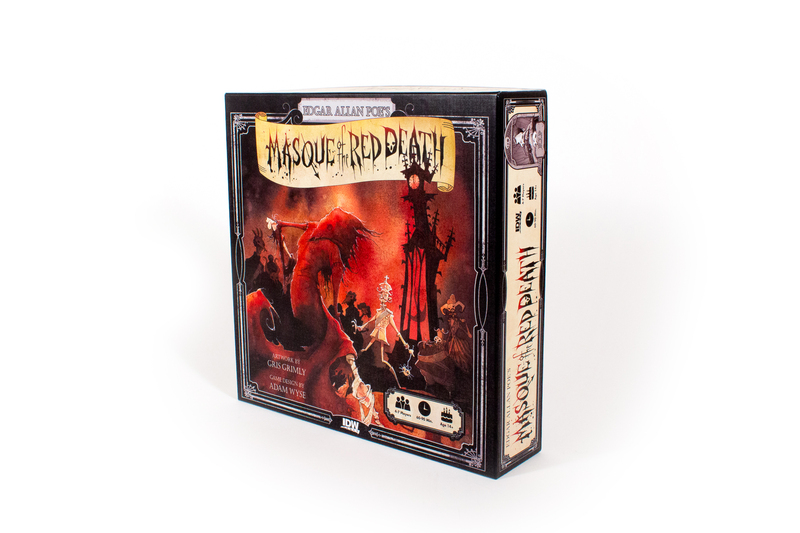 Masque of the Red Death is all about the balance between gaining popularity (to win) and gaining information (to survive). You can’t have one without the other. If all you do is Flirt and Laugh and Dance around all night, odds are you’re going to die after midnight. If all you do is Discuss (to take rumors), you should be able to survive but if anyone else survives they will likely be more popular than you. You must strike a good balance of both. Not knowing for sure if you will survive is what makes the game so tense. It is very important to not fall too far behind in popularity. Players who take advantage of the ability to jump over others on the popularity track will consistently get extra popularity each time they take a popularity action. 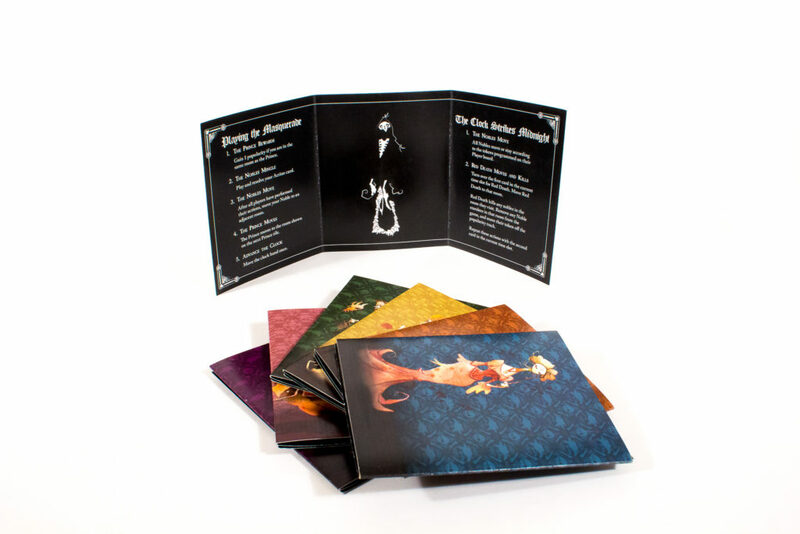 The unique personality card each player gets at the start of the game can be quite powerful, and no one knows which card other players will have. Time it right to benefit as much as possible from your personality card. Movement over the course of the night can be very important. Prince Prospero will be flitting around the abbey from round to round, but players get to see which room he will be in at each time, from the very start of the game. Try to move in a way that gets you near the prince as much as possible. You may sometimes want to bunch up with other players so you can play cards on them, or you may want to get away from the pack so that others cannot play cards on you. Some action cards allow you to lower or raise other players’ popularity or even steal or look at their rumor cards. But be careful about making enemies; they may be looking to get you back later. Stealing rumor cards can often be very effective. If you know nothing about 12:30 for example, when you steal a rumor you are allowed to request a particular time. This is obviously more effective than simply playing a Discuss action to draw a random rumor from the deck. 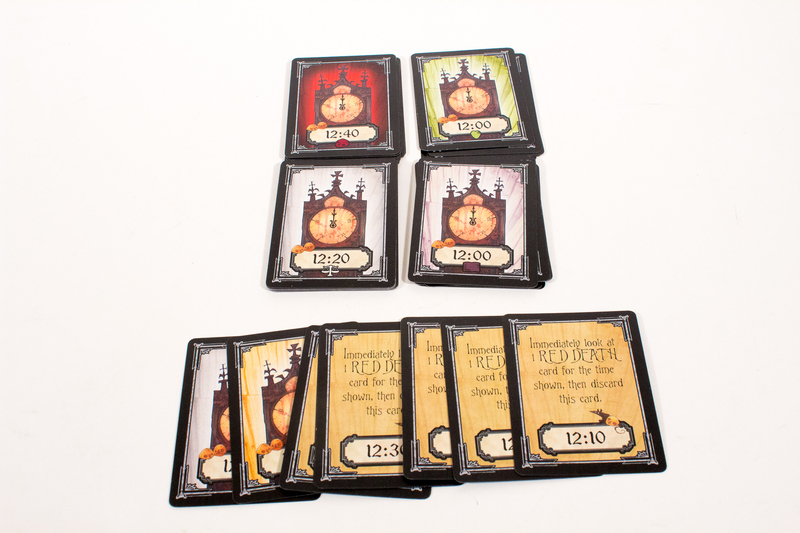 Masque of the Red Death Kickstarter will be launching on January 10th! For any questions about Press and Media inquiries, contact Ross Thompson – ross@idwpublishing.com -. Stay tuned to our social media as we get closer to the campaign and join us for another exciting IDW Games Kickstarter.